More details have been released about what is now being said to be Brisbane’s largest urban renewal project since the post-expo development of Southbank. Premier Anna Bligh released the design for ‘Showground Hill‘ which is a large area encompassing Bowen Hills and the RNA Showgrounds. Lend Lease has now started construction on hard infrastructure elements needed for the future area however today David Rolls – head of development at Lend Lease unveiled plans for the first residential stage of the project which has been named ‘The Green‘. The Green will consist of around 300 apartments which will target to become Brisbane’s first 4 Star Green Star residential complex. The proposal is said to be a different take on inner city apartment living because of it’s emphasis on low rise building, fewer apartments per floor, strong streetscape – ground level integration and variable roof heights which will help to maximise winter sun. Apartments will be mid-range with affordable apartments from $300,000 up to $500,000. 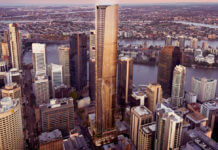 Also included in the design is the potential Suncorp campus headquarters, as Lend Lease is one of five developers vying for the 30,000 sqm Suncorp tender. The RNA Showgrounds is expected to be home to over 3000 people and 15,000 jobs. Hi, thank you for maintaining this website. It’s great and very informative. The new project at Bowen Hills sounds great. We need more flats in Brisbane, but nice ones in nice suburbs! Yes i like this project, and we get to enjoy it even more with the show each year and other events. Hey, I like the look of the new ‘Showground Hill’ project. Just wondering if the Qld government have any alternative plans for North Bank given the scrapping of the old plan? Unfortunately there are no plans for Northbank following the scrapping of the Brookfield Multiplex design. May be some time until a government decides to fix it up.